One of the less common sights in the Rhynie chert is a dense cluster of dozens of mm-size oval objects superficially looking like as many sheep. These objects have been recognized only recently as crustaceans  and tentatively put into the cladoceran clade, which means they are related to the common water fleas. Unlike the latter, which seem to be in perpetual motion, Ebullitiocaris led a virtually sessile life, clinging to plant debris and possibly grazing on algal mats, a behaviour also known from various extant water flea relatives. The fossils do not show much detail except for a segmented tube inside (Fig.2). Fig.1: Flock of the freshwater crustacean Ebullitiocaris among plant debris in Rhynie chert. Width of the picture 8mm. 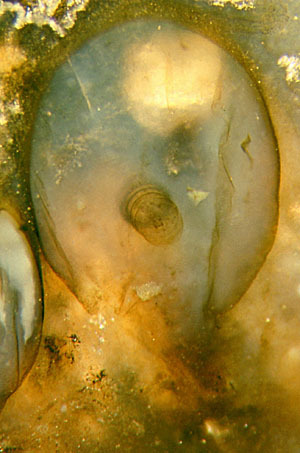 Fig.2: Ebullitiocaris with a segmented tube as the only distinct feature seen inside. Width of the picture 1mm. 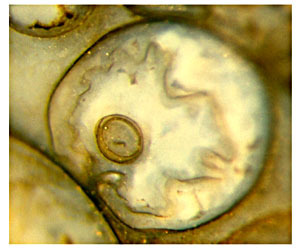 Fig.3 (below): Ebullitiocaris with concentric rings as evidence for the non-spiral structure of the tube inside. The deformation by contact with another specimen below left indicates that the shell was soft. Width of the picture 0.82mm. The alleged spiral structure serves as an argument in favour of the water flea connection. However, the pictures in  do rather not suggest a spiral structure, neither do the specimens in our sample. The tube, or at least part of it, seems to be really composed of short segments like plumbers’ fittings (Fig.3), with a ribbon-like cord inside (Figs. 2,3), which excludes an interpretation as the gut. Apparently in anticipation of evidence contradicting the spiral assumption, the authors  discussed the implication of a segmented structure, too: It would place Ebullitiocaris halfway between conchostracans and cladocerans, as a basal link, and thus give it greater importance than originally thought. 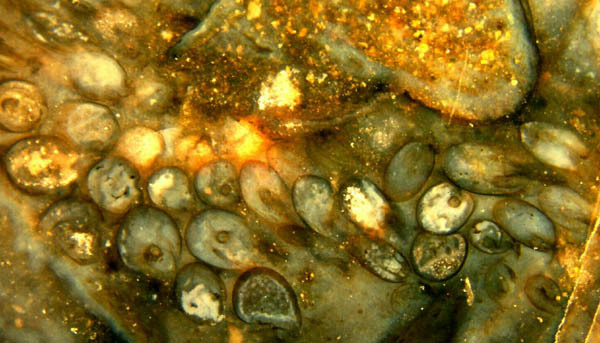 Annotation (2010): Ebullitiocaris is erroneously called rotifer in "Paleobotany". See chapter Errors and Mistakes.